40 - 50 million pronghorns formerly lived from southern Saskatchewan to northern Mexico, west to southeastern Oregon and southwest through the Baja peninsula of California. Some researchers think they may have been even more numerous on the Great Plains than the Bison! The great slaughter of the late 1800's affected the pronghorns as well as the bison. Only about 12,000 remained by 1915. Presently, they number around one million and the greatest numbers of them are in Wyoming and Montana. Less than 2,000 pronghorns live in Kansas. The majority of these are found in just a few counties in the west-central part of the state. Attempt to re-introduce them into the Flint Hills in eastern Kansas have been unsuccessful. They weigh between 75 and 130 pounds, with the males being larger than the females, and stand 31 to 40 inches tall at the shoulder. About 40% of the females have horns, but they don't get any longer than their ears and never fork. A buck's horns are up to 15 inches long and have the distinctive prong on the front which gave the species its name. Another easily observed difference between males and females is the black patch on the jaw below the eye, which only the male has. 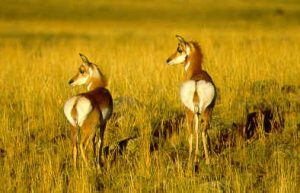 The horn sheath of the Pronghorn is different from either the antlers of deer or the true horns of cattle or Bison. Antlers are shed annually and are made of bone. True horns are never shed and are made of compressed hair (keratin) growing on a bony core. The horn sheath of a Pronghorn is a little of both. It is made of keratin growing on a bony core AND it is shed annually. 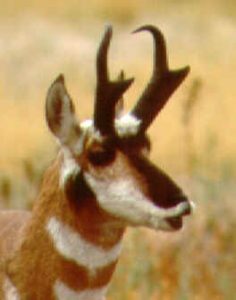 In addition, the horn sheath is branched in male pronghorns. True horns are always unbranched. Pronghorns typically have twins. They are born at the end of winter and weigh 5 - 7 pounds at birth. They can walk in less than an hour and can outrun a man when four days old. Still, they are very vulnerable to predators in their first month of life. Coyotes and golden eagles are their greatest enemies. In order to avoid detection by predators, the fawns have almost no odor and will bed down and lie still most of the time. The doe visits every 5 hours or so to nurse and check on them. The diet of pronghorns consists almost entirely of forbs (non-woody flowering plants) and brush. Grass makes up a very small part of the diet. Sagebrush can be critical to pronghorn survival during harsh winters when the snow is deep and other forage is unavailable. It is the only living member of its family in the world. It is the fastest land mammal in the world. It can sprint as fast as 60 mph and can sustain a speed of 30 mph for miles! The African Cheetah is often credited with being the fastest, but it is only a sprinter who flags out after a few hundred yards. No other land mammal can keep up with the Pronghorn over a long distance. When they encounter a fence a Pronghorn will usually crawl under it! They seldom jump over one. The eyes of a Pronghorn are nothing short of exceptional. They can pick up movement as far as three miles away. The eyes are located far back on the head so they can keep watch even while the head is down during feeding. Human eyes need a pair of binoculars to see as well as a Pronghorn. Move your mouse over the picture to see how quickly they notice something new in their habitat! The Pronghorn's speed and its remarkable eyesight are adaptations for life on the prairie. It needs to be able to spot predators such as coyotes and wolves as far away as possible. And, since there is no cover for it to hide in, it needs to be able to outrun any predators that manage to sneak within striking range. It can do both easily. Pronghorns have a strong herd instinct. This is another adaptation for defense against predators. Dozens of sharp eyes watching make it very difficult for any predator to make a meal of a pronghorn. On the other hand, a herd is easier for a predator to find than a single individual, so confrontations with predators are inevitable. Running away is the final line of defense, and even that is highly refined in pronghorns. The herd runs in perfect unison in a very tight, oval-shaped formation, much like a flock of birds. Pronghorns will flare out the white hairs on their rump when alarmed. This serves as a warning to the other members of the herd. Herd living requires an advanced social order. Individuals, both male and female, fall into a status ranking that is maintained with subtle glances, vocalizations and body language. This keeps conflicts to a minimum so the herd can concentrate on the challenges of survival on the prairie. Bucks will sometimes fight with each other during breeding season, but ordinarily the herd is very peaceful. People have long remarked about the Pronghorn's great running ability. Pioneers on horseback could not catch them and when people started driving cars, they would sometimes try to out-race one. A pronghorn likes a good race, as it turns out, and seems to relish humiliating any challenger that comes along. One classic account was recorded by Arthur Einarsen (in his 1948 book The Pronghorn Antelope and Its Management) of a day when he and two colleagues were driving around their study site in Oregon. 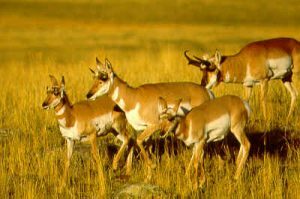 "On August 14, 1936, I was with a group that paced many pronghorns on the dried bed of Spanish Lake in Lake County, Oregon. This lake bed was as hard as adobe. It was a clear, breezy day...ideal to stir the racing instincts of the pronghorns, and as we rolled along the lake edge we had many challenges. Small groups here and there raced beside the car, until five, led by a magnificent buck, ran parallel to us, pressing toward the shore from the feeding area in the lake center while we drove on a straight course. As they closed in from the right, the buck took a lead of about fifty feet and Myers increased speed to keep even with the animal. Dean Schoenfeld watched the speedometer, Myers drove the car, and I photographed the moving animals. The buck was now about 20 feet away and kept abreast of the car at 50 miles per hour. He gradually increased his gait, and with a tremendous burst of speed flattened out so that he appeared as lean and low as a greyhound. Then he turned toward us at about a 45 degree angle and disappeared in front of the car; to reappear on our left. He had gained enough to cross our course as the speedometer registered 61 mph. After the buck passed us, he quickly slackened his pace and when he reached a rounded knoll about 600 feet away, he stood snorting in graceful silhouette against the sky as though enjoying the satisfaction of beating us in a fair race." Later researchers have disputed the top speed attributed to pronghorns by Einarson, but the racing instincts of these magnificent animals and their tendency to cross in front of a rival as a final triumphant flourish have been witnessed by many observers. Pronghorns are a vivid reminder of the living heritage of the Great Plains. Seeing them on the prairie is an inspiring sight -- just remember that they most likely saw you first!